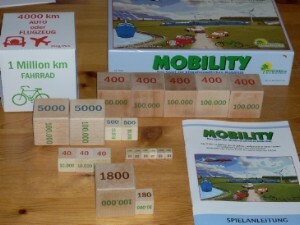 THE EDUCATIONAL GAME ON CLIMATE-FRIENDLY MOBILITY consists of so-called iso-emission-cubes in different sizes. 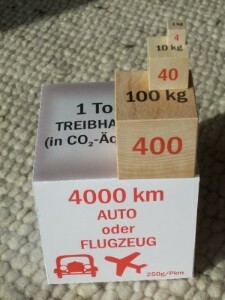 The cubes represent a certain quantity of green house gases (GHG in CO2 -e )from 1kg to 1 ton. Each of the 6 sides of a cube represents another means of transport and the numbers in different colours explain how far you can travel with a plane, car, hybrid car, train, bicycle etc. till you have produced the amount of GHG the cube is representing. MOBILITY WORKSHOPS are a training for a more sustainable lifestyle. There is a focus on global interactions. You learn to analyze existing patterns of mobility,housing and eating and to creatively search for more sustainable and healthier ones. The game is useful for communities, it is also used in environmental education in highschools. Participants work in teams and have to find out best mobility solutions with lowest emissions for persons in simulated scenarios. The team which presents a feasable solution with the lowest emissions over a year is the winner. The game is to stimulate creativity in finding a more sustainable way of mobility. It has been awarded in Germany and Austria. It is available in several European languages.